The starting point for your TV experience. To bring up the main menu, press on your remote. Then, use , , and to navigate to and in each of the menu options. To exit, press or . If the main menu has been idle for a few seconds, it will disappear. To go back to the previous screen or content, press . The on-screen channel guide shows you every program on every channel airing within the next 12 days. To open the guide, press to bring up the main menu and select Guide or use voice commands and say "Go to Guide." 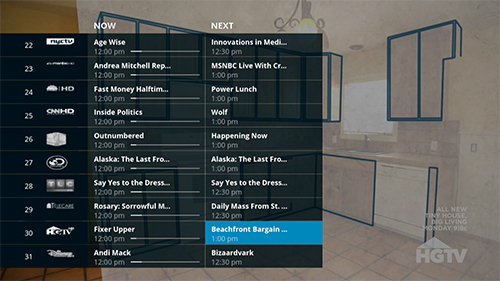 TV listings appear in a grid format, with channel numbers and network names down the left side and show times along the top. Use and to move one channel up or down one at a time. Use to move up or down several channels at a time. Use to advance in the grid one time slot at a time; use to go back to the previous time slot. Enter a channel number using the numeric keypad on your remote to jump immediately to that channel. To view basic information, highlight a program on the grid. 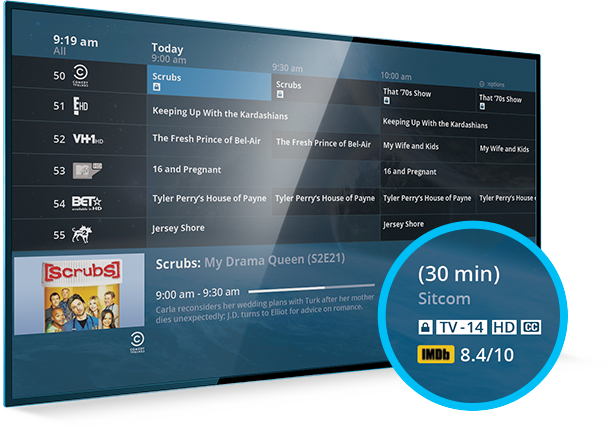 A banner will appear at the bottom of the screen with the program name, description, start and end time and program rating information. Press SELECT to choose a program. If the program is on now, you'll tune directly to the channel. If the programming is airing at a future time, you'll go to the "Info" screen. You can also press on your remote to access the "Info" screen. To exit the guide, press the or . You can filter the guide by day and time or favorites. Just press to open "Quick Settings." The info bar appears at the bottom of live TV when you press or change channels. The bar shows what you're watching, its start and end time, and what's coming up next on the channel. Plus, it lets you check out what's on other channels or see information about upcoming programs without leaving the program you're watching. It's also includes a progress bar that shows start time, end time and the "O" shows you where you are in the program you're watching. 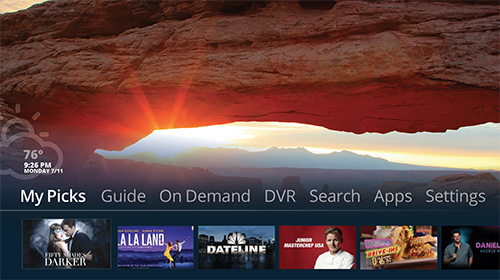 Press and to browse programs on the current channel at different times of the day. Press and to browse different channels. Press SELECT to bring up a menu with helpful options like "Tune to Channel," "Record" and "More Info." To close the info bar, press . The info bar will also disappear automatically if it has been idle for a few seconds. There is another way to check out what else is on without leaving your program - the quick guide. Press twice while watching a program on live TV to see what else is currently on. Press three times to see what's airing next after the current program ends. Use and to move one channel up or down at a time. Use to move several channels up or down at a time. Press SELECT to choose a program. If the program is on now, you'll tune directly to the channel. If the programming is airing at a future time, press SELECT to get the "Info" screen. You can also press on your remote to access the "Info" screen.